I want to say the ‘t’ word. Julie Child would never say it, nor allow those around her to say it. I’ve read many books about Julia; she was known for cooking tirelessly (almost said it!) then exuberantly heading out for a late night on the town. But if you want to say you’re tired of planning meals (come on, even if you like to cook that can happen, yes?) I’ll understand! 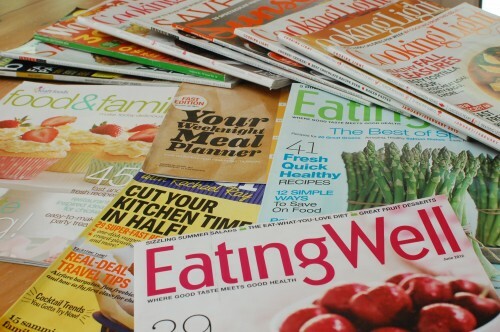 That’s why I’ve decided it’s time to cook from the plethora of food websites, clippings, magazines and cookbooks I collect. Besides, as my friend Dianne Jacob wrote about food blogging, it takes at least 6 hours (often more – I know) to create, and write, and photograph, those recipes. So I’d like to give credit for that work! 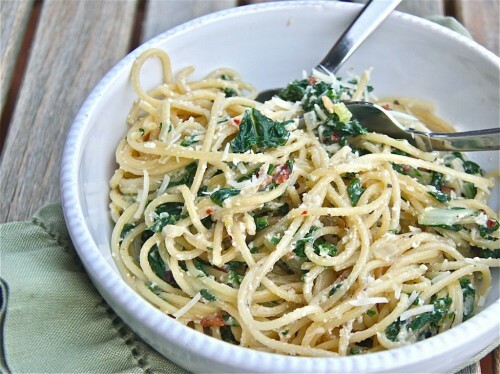 I was checking email one afternoon when up popped this post notice titled: Swiss Chard and Lemon Ricotta Pasta. The photo appealed to me, I could see it was quick to make, and by chance I had the ingredients with the exception of kale instead of chard. Two things I liked: 1) blanching greens in the pasta water before sauteing with the bacon and shallots is a quick way to soften the stems 2) ricotta adds creaminess without being overly rich, and is perfect for using up a small amount of leftover ricotta cheese. Dinner was planned and I’ll use these ideas again! Look for more of my recipe finds in future posts. Thank you so much for featuring my recipe, Rosemary! You have made my day. And I can’t tell you how often I find myself in the kitchen at seemingly the last minute trying to quickly figure out what the heck to make for dinner for Myles, my carnivore husband, and me, a wimpy vegetarian but trying hard. You’re tapping into a huge need out there!! Great approach! Happy to share your recipes Susan! I do feel we’re spoiled that we have so many choices we can’t make a decision. I often find myself staring at grocery carts wondering what other people are making for dinner. And more than once I’ve asked them! Wow! I can see why you chose that recipe. And Susan is a former student of mine. Small world. Thanks for the link, Rosemary. I enjoyed seeing your personality come through in this post. Thanks Dianne. I hope readers link to your post! Thanks for another good article. I enjoy reading them everytime. Thanks Lili — great to hear from you! If you have any favorite recipes please pass along.